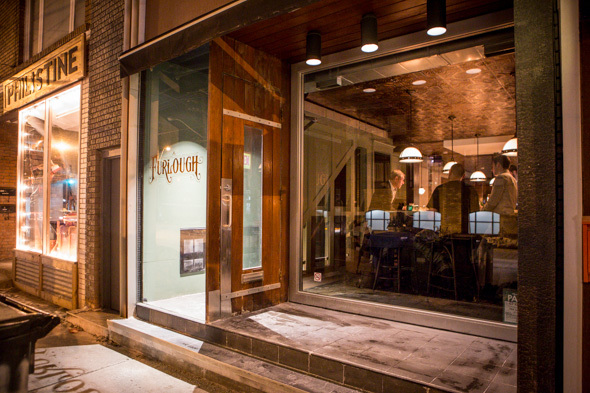 Furlough is a new restaurant from the brains behind BarChef serving European bistro fare. It opened two months ago, taking over what was previously Ursa . Owners Brent VanderVeen and Frankie Solarik have given the space a classy, speakeasy feel, with candlelit tables, patterned tin ceiling tiles, dark wood and leather furnishings, framed art on one wall and framed mirrors on another. Frank Sinatra and Louis Armstrong tunes croon in the background while staff in suspenders and bow ties indicate that the ethos is artisanal here. VanderVeen tells me they named the place after a term for a "leave of absence" because they want patrons to have a temporary escape from the drudgeries of daily life here (particularly the crappy winter we just experienced). 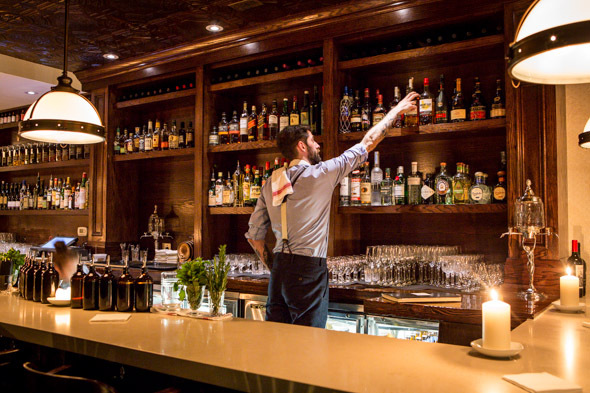 While they think of BarChef as a bar with food, this is a restaurant with a bar, albeit an excellent bar, which takes up a significant amount of space. 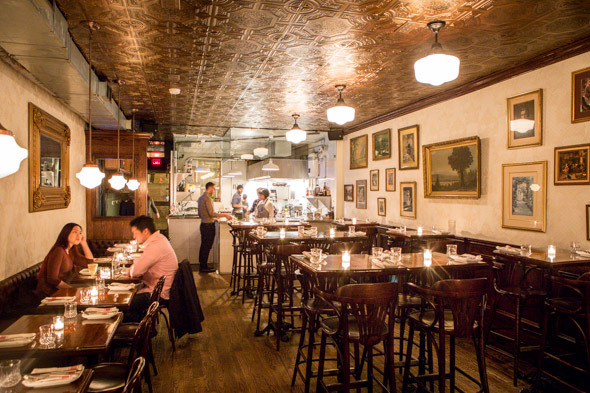 "We want people to have amazing food and amazing drinks," VanderVeen says. As expected by the people who created one of Toronto's best cocktail bars , the drinks here really are top notch. 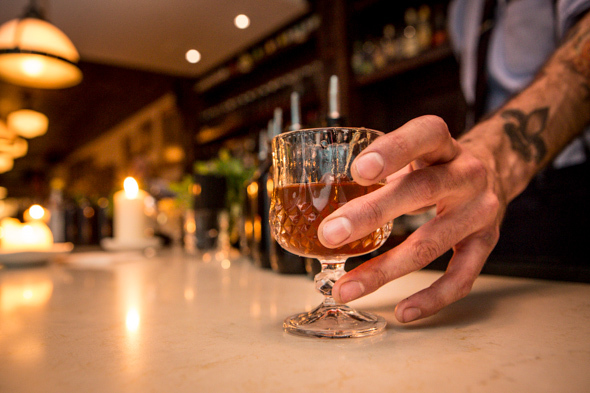 In contrast to BarChef's more avant garde, experimental libations, Solarik has created a menu of 15 classic and 15 contemporary cocktails for this joint that focus on darker spirits like brandy and bourbon. 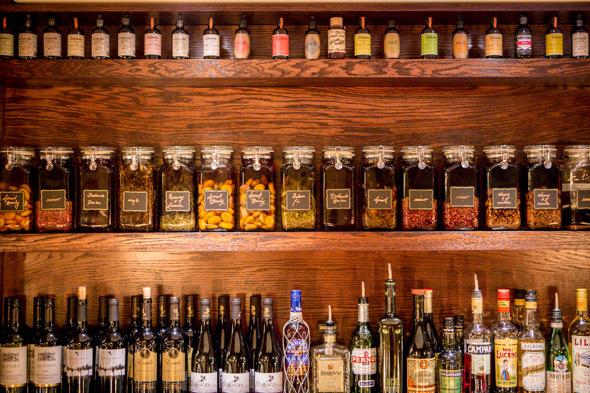 The long bar boasts bottles of Dillon's bitters and house-made syrups and infusions lined up like elixirs, giving off an apothecary vibe. 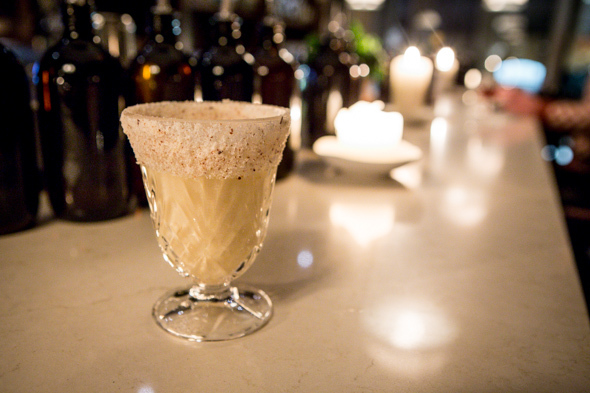 Concoctions made here could just cure what ails you. We try two of the cocktails from the contemporary part of the menu, expertly mixed by Brett Paulin, who previously worked at BarChef and is now overseeing things here as bar manager. The eponymous signature drink Furlough ($14) contains Backwoods-infused bourbon, patchouli syrup, cacao bitter and sweet vermouth stirred over ice and strained into a glass. A dramatic final garnish is an atomized essence of cigar lit with a flame. You'd think patchouli syrup would taste like old hippies, but in reality it's pleasantly sweet, floral and woody, and actually works well with all the other ingredients, making for a smooth and complex drink. The essence of cigar is cool but a bit over-the-top, and reminds me of this . Pineapple and Almond Crusta ($14) is an easy palate-pleaser, combining Pastis, Amaretto, fresh lemon, almond orgeat and pineapple juice, shaken and fine-strained into an almond sugar-rimmed cocktail glass. It's light, sweet and refreshing, with a subtle licorice/anise flavour, and the sugary crust lining the rim reminds me of a melted candle - but tastier. There are no beers on tap - "It's cleaner that way," says VanderVeen - only bottles of local craft and European beers ($7.50-$10). A curated selection of wines come mostly by the bottle ($40-$90, $120 for Champagne) and a few by the glass ($9-$11). 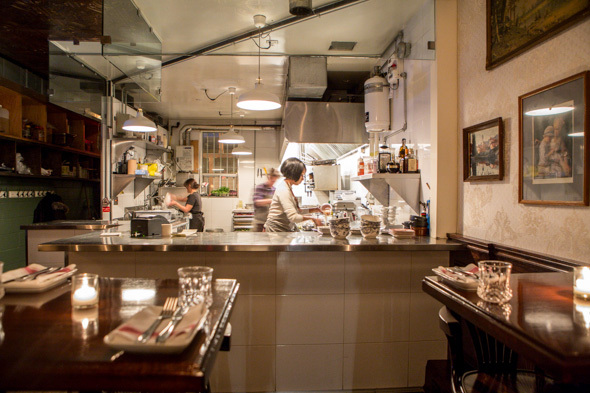 An open kitchen helmed by chef Harrison Hennick turns out refined European dishes, mainly French- and Italian-inspired. 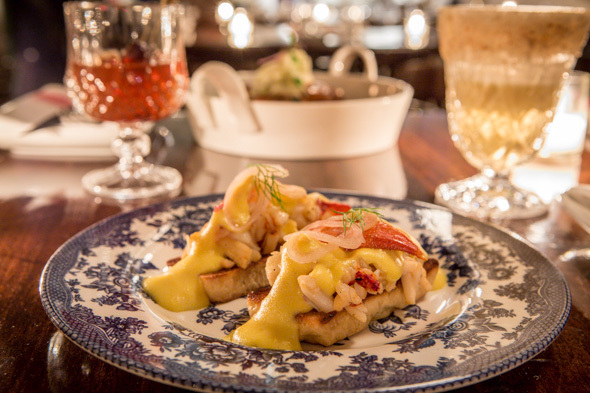 From the smaller plates, there is lobster on toast ($13): two pieces of brioche topped with a generous amount of the luscious crustacean meat. It's buttery and sweet, and I could eat many, many of these if my wallet would let me. 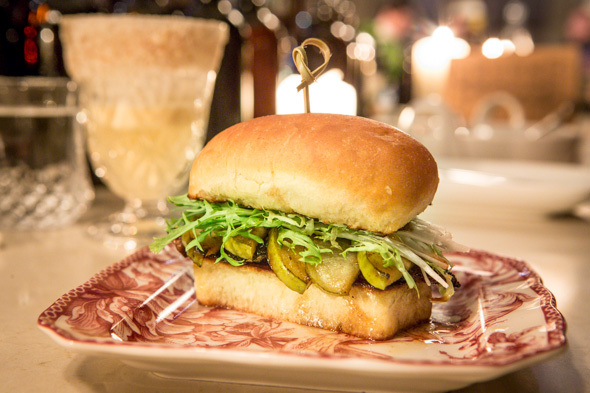 Also on the small plates side of things is the foie gras with caramelized apples and frisée sandwiched between pain au lait ($17). It's pretty decadent, with the sweetness and acidity from the vinaigrette pairing nicely with the fatty foie and its crunchy accompaniments. I'm also always a sucker for sweet bread. 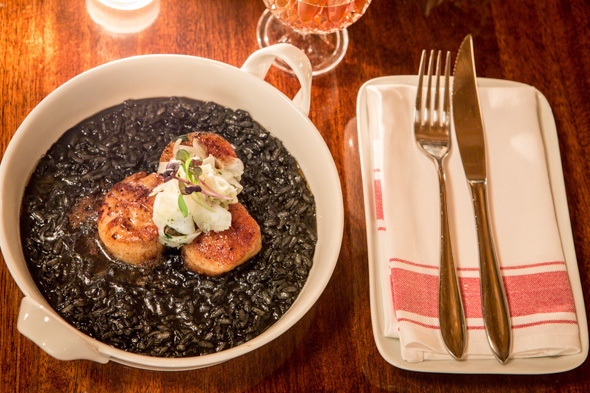 Squid ink risotto ($26) has three perfectly seared scallops on top, along with pickled shaved fennel. This is a pleasure to eat - it's creamy, buttery and seasoned perfectly - utter decadence. Again, this is something I'd eat regularly if my arteries and budget would allow for it. One of the servers tells us the French onion soup is also to die for; it uses veal stock cooked for three days and is finished with Madeira. I'll have to come back to try it, as well as brunch. Perhaps when the back patio opens and after I've received my tax return.